Air accident officials have begun to move parts of the light aircraft that crashed in Co Offaly yesterday evening, claiming the lives of the pilot and a seven-year-old boy. The boy has been named as Kacper Kacprzak, the son of a Polish national living in west Dublin. His father was one of 16 parachutists who jumped from the plane earlier during a scheduled jump. Relatives of the 47-year-old English pilot who also died in the crash will arrive in Ireland tomorrow before gardaí release his name. Parts of the Cessna aircraft have been moved to a local warehouse to allow for a forensic examination. Officials from the Air Accident Investigation Unit are continuing to examine the crash scene. 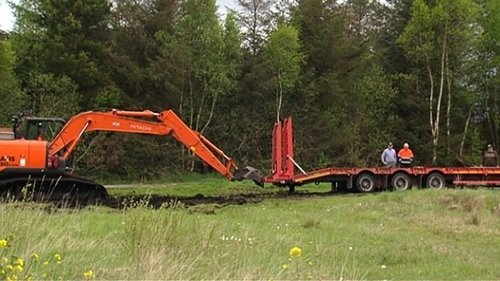 Gardaí have called in Bord na Móna with large track machinery to assist them in their investigation. It is believed that part of the plane may be more than four metres under the surface of the bog. Last night, the remains of the two were taken from the plane's wreckage in the bog after a six-hour recovery operation. Post-mortem examinations are due to take place at the Midland Regional Hospital in Tullamore. The pilot was recognised as a vastly experienced flying instructor. Meanwhile, a local councillor said there was a sense of "disbelief, shock and horror" following the crash. Speaking on RTÉ's Morning Ireland, Offaly County Councillor Martin O'Reilly said that the seriousness of the incident is only just setting in. He said: "There was a sense of disbelief, shock and horror at such an incident in our area, particularly associated with the parachute club. We're only waking up to this shocking news and it's only setting in, how serious it's been." Mr O'Reilly said the area the plane crashed into gets quite a lot of footfall with walkers and cyclists. He added there that there is a lot of activity at the parachute club but there has never been an incident like it. "You'd have a lot of people going out to the club doing fundraisers, parachute jumps for local charities and stuff. And there was never an incident, never has been an incident," he said.